Examinations are an important aspect of every student’s life – be it in school or in college. Examinations are conducted to assess the knowledge, skills and retention ability of the students. Students will be motivated to achieve more, learn more and understand more when they write their exams. Months of training, preparation, practice, tips and strategies are required to score well in the examinations. Students need to invest a lot of time and efforts in order to get good grades. They need to look into their notes, textbooks and previous year question papers as well as take the guidance of teachers for excelling in their exams. Writing an exam is not the only step towards achieving success. It is equally important for the students to analyse their scores and plan strategies accordingly, that is whether they need to improve the scores of the subjects which they might be very weak in or focus more on scoring even better than they would have in their previous exams. Many times, students do not get timely information about the schedule of the exams and also in getting the marks cards on time. Using the examination module in online school management software, students can view and download their marks cards for all the examinations. 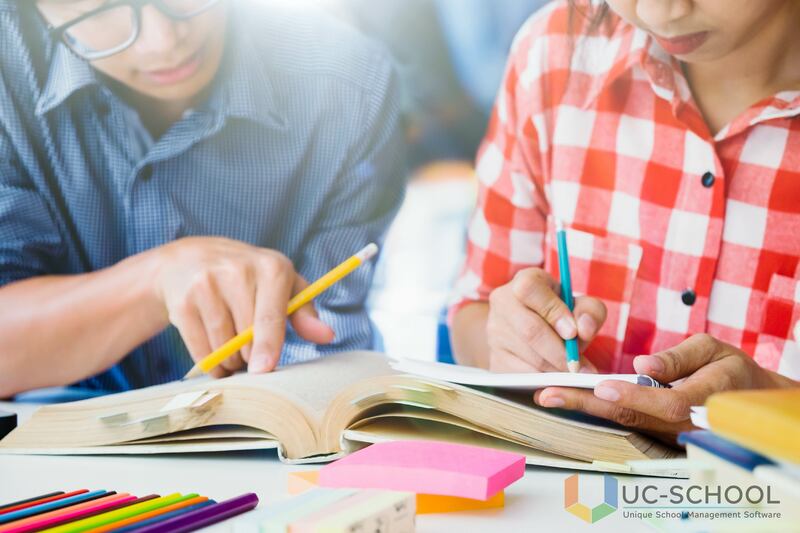 This module also facilitates the quick and instant upload of exam time-table, with the help of which students can start making their own preparation schedule for each subject of the exam. Students can get to see the marks scored by them in a statistical format, thereby enabling quicker comparison of the subjects in which they are strong and those in which they are weak. The students ranking as compared to the rest of the class is also shown by the online school management software. One of the most distinguished features in school management software is course management. Using this feature, teachers can upload the content of the course to be taught for that particular semester or year. This information uploaded can be used by the students in getting an idea of what course content will be taught for each year, which will be really helpful for them in preparing basic concepts of the subjects beforehand. Teachers can share important documents like notes, important chapters which have high weightage in the exams, previous year question papers, assignments, projects, etc. on the portals of the students using school management software. All such documents uploaded will prove to be extremely useful to the students in their overall strategy for the exam preparation. Now students can find a way to constantly interact with the teachers by making use of school management software which provides the perfect platform for this purpose. Students can ask the teachers for any doubts that they might be having in any of the subjects. This ensures doubts getting solved on a real-time basis. The potential benefits of online school management software are plenty, especially in relation to the examinations. Schools should try to implement school management software in such a way that it provides more ease to the students’ overall examination preparation plans and strategies.